Raise your hand if, after reading the book’s description, you thought this might be a survival story. You’re wrong! …kind of. They do wear suits similar to the following picture, and there are major scenes involving mass destruction. How I imagined the story matched many things in the picture below. However, this is the jist. Focus – Jarra, abandoned to earth when born. Subject – Discrimination against her kind. Neans like her can only survive on Earth. What does she do in the face of this intolerance? Why, she applies to the prejudiced exo’s college of course. How does she manage this when she cannot leave earth? By choosing a prehistory class based on Earth. What is this girl thinking? Honestly, it doesn’t matter in the moment, she is going to have so much fun messing with the exo’s who won’t know she is a nean. Then…she meets them. I must say this is definitely a book for scifi fans, but it is also for those who love a good character story. Our question is, “How long can she hide her true identity”. I mean she knows a lot about Earth that these exos (people who left during the great exodus hundreds of years ago) don’t, and she’s been slipping up. Ticking time bomb here. Not to mention, Jarra’s original plan to fool the exos is starting to look stupid, especially as she becomes closer to them in the intense place a dig site can be with a crumbling New York around them endangering them constantly. Let’s link this back to her motives. Jarra doesn’t know who her parents are but she assumes they are like the rest of humanity disgusted by her kind and had dropped her with the government program so they could erase the fact that she came from them. Her unacknowledged desire seems to be to prove her parents wrong about neans. Janet Edwards did a great job with her character. It feels as if every experience is challenging Jarra to face her lack of confidence in herself. Jarra needs to embrace who she is. This is a coming-of-age book as much as it is a science fiction novel. My only problem is Jarra’s mental breakdown toward the end. I’ve had two friends who have had similar experiences that were more extreme, so maybe this is why it was distasteful to me. I expect it’s the same for someone who has dealt with cancer reading “Fault in Our Stars”. Let’s summarize! I loved Jarra. She is knowledgeable and confident in most things if not in her identity as a nean. Not to mention the setting was like a college campout. 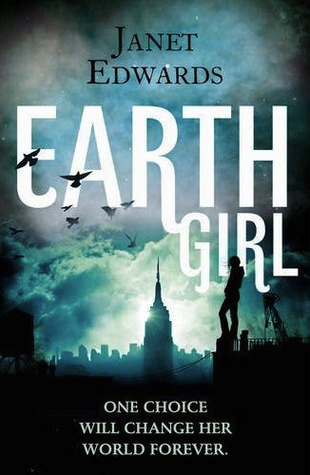 So, if you like a “real” character who grows, plus scifi on Earth, this book’s for you! This entry was posted in Uncategorized and tagged coming of age, dig site, discrimination, Earth Girl, Janet Edwards, military kid, portals, science fiction, scifi, teen, young adult. Status Update: I am alive!